Bang & Olufsen’s most affordable multi-room speaker is a strong value. Given this brand's reputation and the traditionally steep price of its hardware, I expect a lot from a Bang & Olufsen product. True to form, B&O's Beoplay M3 multi-room speaker is an excellent choice—for the right set of ears. At $300, the lowest price for a B&O multi-room speaker yet, corners were cut in the name of affordability. These cuts were made in the area of audio quality. Understand that this speaker sounds very, very good. But the monaural listening experience it provides, in concert with the digital signal processing B&O employs, might be unappealing to audio purists. Sized at 5.9 by 4.4 by 5.5 inches, the M3’s footprint is small enough that it can it can be sat on a countertop or shelf without eating up too much space. A rubber baseplate, along with the speaker’s 3.2-pound heft, ensure that when it’s placed, you won’t have to worry about it being knocked over or dragged off a table. The M3 can be had in a matter grey (as tested) or matte black finish. There’s no handholds or nooks built into the M3 to pick it up by. But its rubberized exterior provides enough grip that you won’t drop it during transport. The M3 has a removable cloth speaker grille that can be swapped out for other color and material options—provided you pay for them. While its size could allow it to pass for a portable speaker, the M3 won’t do anything unless it’s drawing power from an electrical outlet. In keeping with the speaker’s minimalistic design, B&O hid where the M3’s power cord connects to it, underneath a hatch built into its baseplate. You’ll also find a micro-USB port for charging portable devices here, along with the M3’s 3.5mm audio port. 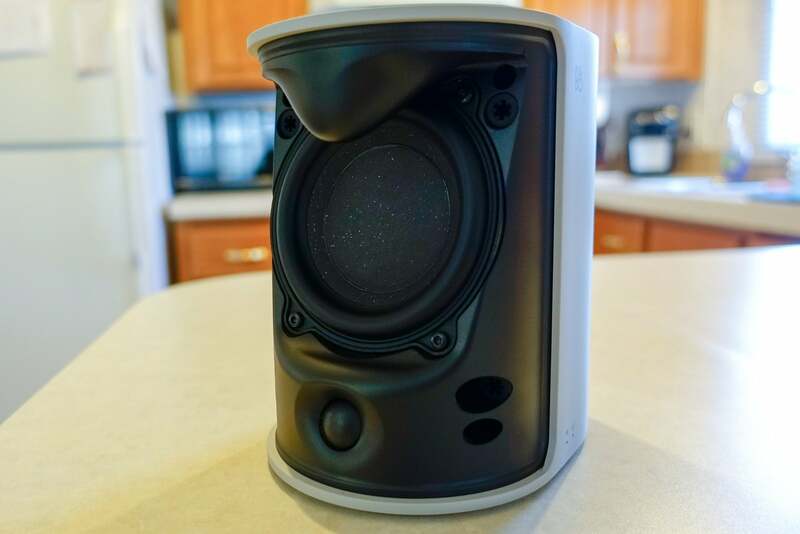 Once the hatch is closed, any connected cables are channeled through the back of the speaker. Nice and neat. A look under the M3’s grille reveals some impressive drivers. The speaker will accept input via Bluetooth 4.2, Apple AirPlay, or Google Chromecast, making it easy to add the speaker to your existing multi-room setup. Or, if you want to kick it old school, you can use the 3.5mm input for a wired connection. 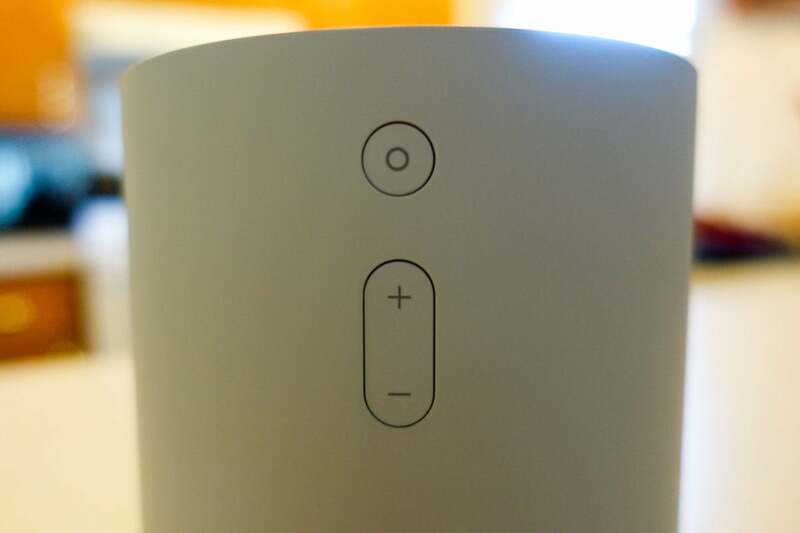 Noticeable by its absence is Spotify Connect—a feature that comes baked into B&O’s more expensive Beoplay M5, as well as some less-expensive multi-room competitors (including the Sonos One). The M3’s only physical controls can be found on the back of the speaker: volume controls and a multifunction button that can be used to play/pause music or switch between audio sources. As most people control their music via a connected device these days anyway, I don’t consider this lack of on-device controls to be a big deal. While you’ll be able to use your phone’s music, podcast, or video apps to feed audio into the speaker or control its volume, any further tweaking of the M3 requires that B&O’s free Beoplay app be loaded onto your smartphone. With the app, you’ll be able to easily shape the speaker’s sound profile, for use in an open environment, or for when it’s tucked up against a wall or in a corner. The app’s EQ is dead simple to use, too—you’ll find no sliders here. In their place is series of concentric circles, split into four zones: Warm, Bright, Excited and Relaxed. Moving the dot within these concentric circles within a given zone changes the speaker’s sound. It’s dead easy. Once you hit upon a setting that you like, it can be saved as a preset. B&O also provides a few presets of its own to get M3 users started. Aside from these volume controls and a multifunction button, the M3 is controlled entirely by your audio source. Inside of the M3, you’ll find a 3.75-inch woofer and a 0.75-inch tweeter, which bring the noise via 40 watts of amplification. To test the speaker, I used my iPhone 7 Plus as an audio source, listening to music, podcasts, and the occasional video over the course of a week. I also spent an hour listening to a playlist of five songs that I know inside and out: “Feel Right” (Mark Ronson, featuring Mystikal), “Up & Rise” (Hazmat Modine); “Shake Your Hips” (The Legendary Shack Shakers), “Déjà Loin” (Yann Tiersen), and “I’m a Little Mixed” (Diana Krall). I tend to use these songs for testing as they span multiple genres and feature strong, deeply layered performances. No matter what I listened to, the M3 delivered excellent audio experience. There’s no shortage of bass response here—at times, such as while listening to “Feel Right,” the bass seemed to step on the mid- and high frequencies—but only a bit. Once I adjusted the speaker’s EQ settings, the song retained all its thump without losing the shrill clarity of the track’s brass work. 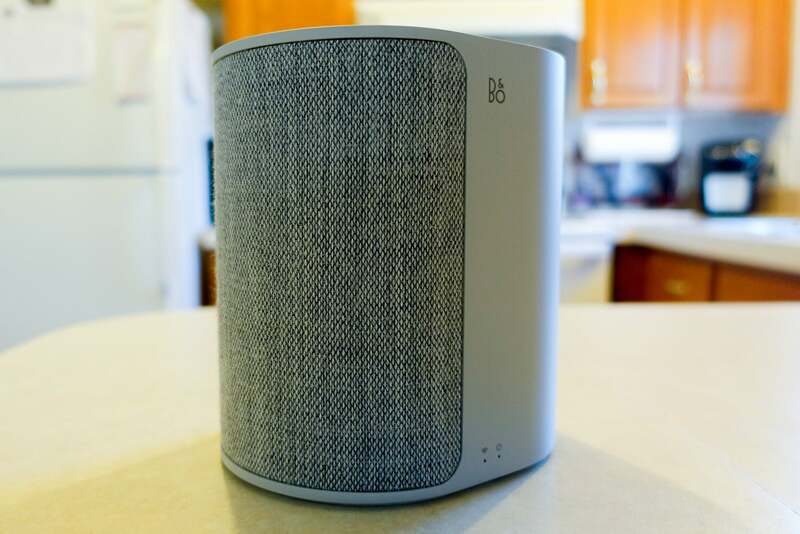 This followed with the other tracks on my playlist as well: B&O designed this speaker to offer a beautiful level of audio separation in a compact package at volumes that’ll fill a mid-sized room with sound with no distortion at most volume levels. You should know, however, that it’s sound won’t be loved by everyone, for a few reasons. Like all B&O produxts, the M3’s design is sleek and minimalistic. To keep the audio from distorting at higher levels, B&O employs digital signal processing (DSP) to limit the amount of low-frequency sound that the speaker kicks out. The good news is that DSP allows the speaker to maintain the same awesome audio separation at high levels as it does at low levels, with no distortion. The bad news is that DSP messes with what your music sounds like—providing listeners with less bass than the artist and the track’s audio engineers intended. This could be a letdown to audiophiles. Additionally, like similar small multi-room speakers from Sonos and Bose, the Beoplay M3 is a monaural affair. If you’re after stereo sound, you’ll have to look elsewhere or buy two. 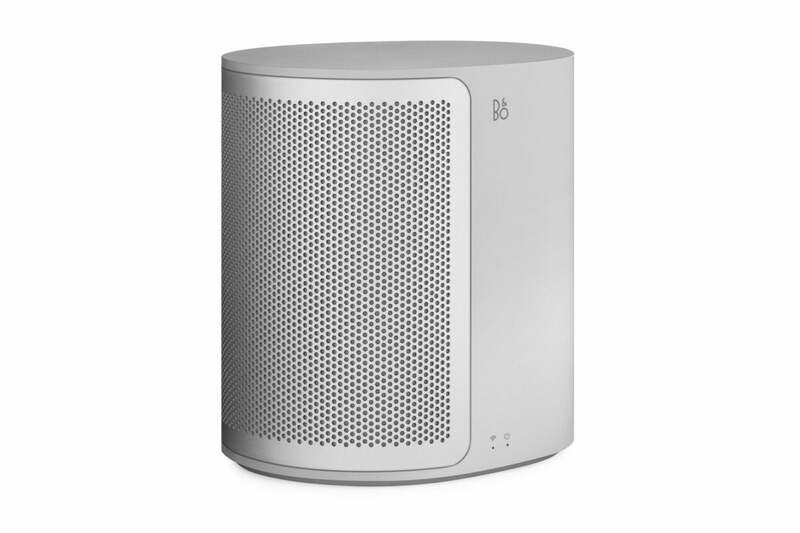 Thanks to the plethora of connection options, minimalistic design, and rich bass-heavy sound, the B&O Beoplay M3 is an excellent choice for anyone interested in building a multi-room speaker system for their home. But, as it’s more expensive than many of its competitors with similar specs, produces monaural audio, and utilizes DSP, it may not be everyone’s cup of tea. The B&O Play Beoplay M3 is a little expensive compared to competing multi-room speakers, but its sleek design, broad connectivity options, and excellent sound make it a contender.